This post is part of our blog series leading up to the 63rd annual National Conference of Law Reviews. Guest contributors will be sharing what they will be presenting at the NCLR conference, how they have been helping to organize it, or why they are attending the conference this March. In this post, Dylan Rettig, Editor-in-Chief of Florida Coastal Law Review writes about his role in preparing for the conference. Spring semester is here at law schools around the country, and for many students that means thinking about summer plans. Don’t get too carried away just yet though, there are still important opportunities to take advantage of this semester including the National Conference of Law Reviews (NCLR). Every year at this time, the nation’s premier editors come together to attend NCLR, a conference devoted to discussing important issues affecting law reviews nationally. This year’s event will be hosted by Florida Coastal Law Review in Jacksonville, FL, from March 23rd through 26th. The NCLR is a great learning opportunity for those in attendance with sessions and panels designed to give editors new insights to help them tackle the issues facing law reviews around the nation. This year’s NCLR will be no different. This year’s NCLR will feature a diverse group of speakers from all walks of the legal field presenting on topics that are of particular interest to them and will surely inspire the editors attending. As in any good conference, the goal of the NCLR is to provide answers to common questions that attendees have. We hope attendees will leave the NCLR with new knowledge regarding how to effectively run a law review in these changing times that will transmute back to the individual law reviews for an efficient and productive year. How do we hope to provide this knowledge? Through an assortment of ways. Author engagement – what does an author look for in a law review, what do they expect, and how do they like to be treated? Staff training – how to effectively teach Bluebook to new staff members, how to use law review knowledge in practice, and how to write a great note or comment. Board management – how to host a great symposium, how to set a realistic publishing schedule, how to handle plagiarism when it arises, the do’s and don’ts of being an Editor-in-Chief, and how to use social media to enhance your law review’s impact on the legal community. All of these topics and more are covered every year at the NCLR and are essential to effective law review management. While the weekend is packed with speakers presenting on important topics, any good conference needs some fun and relaxation as well. With the NCLR being in Jacksonville during the not-so-cold winter, the attendees are presented with a great opportunity to see the natural beauty of the city. We have excursions available for attendees to go to Jacksonville Beach, as well as a day trip to St. Augustine, the nation’s oldest city. There will also be plenty of opportunities for attendees to explore downtown Jacksonville and the variety of nighttime activities that are offered. 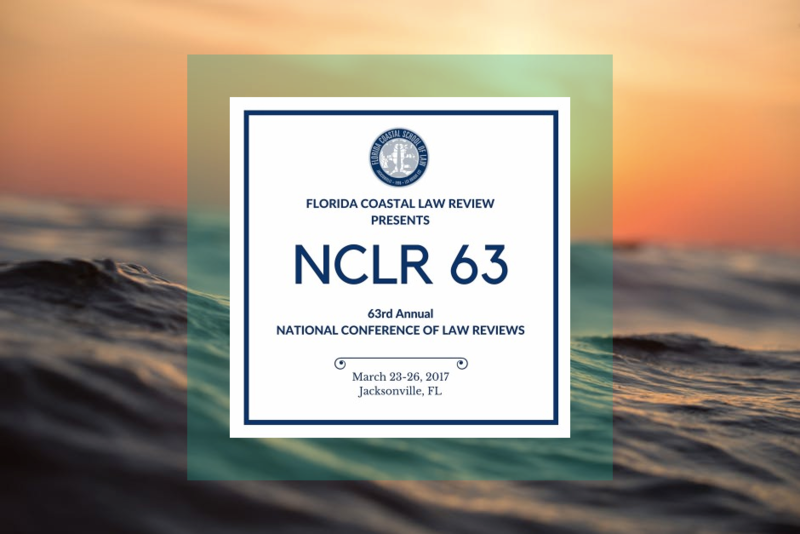 The NCLR is an exciting opportunity for the Florida Coastal Law Review, as we will be hosting hundreds of editors from around the country for the purpose of sharing knowledge and practice pointers, all with the hope that each attendee will pick up something that will influence their particular journal for the better. Even if you think your journal is doing everything that needs to be done, one pointer from the NCLR may make a big difference to your journal . The NCLR doesn’t just happen, however. It takes a lot of time and hard work for the journal hosting the conference to ensure its ultimate success. This year’s NCLR has been no different. A special Conference Editor position was created on our Florida Coastal Law Review board this year. However, one person - especially one in law school, on law review, and possibly partaking in extracurricular such as moot court, mock trial, or a job - cannot devote the necessary time to ensuring the event’s success. The most effective way to handle the planning associated with a conference is to not only distribute the workload, but also the accountability. It is easy to cast blame on one individual when an event fails, but it is much tougher to cast that blame when a large group of people cause an event to go badly. Understanding this, our Conference Editor, Sarah Baniszewski, created a Conference Committee to assist with the planning of the NCLR, and the tasks for the NCLR were delegated to the members of the Committee. This ensures that no matter the outcome, it is the collective group that takes the blame, or praise, for the event. The Conference Committee this year was composed of a diverse group of Staff and Board Members of the Florida Coastal Law Review who saw this as a fantastic opportunity for the organization. Exorbitant amounts of time, sweat, and tears have been spent making this a great NCLR, in line with those of our predecessor host law reviews. You might say, “It takes a village to host an NCLR.” The NCLR is special in that it is a student created, run, and hosted conference, thus putting considerable pressure on the students hosting the Conference. None of us had any experience hosting such an event. But with the assistance and guidance of the past hosts, especially those at Syracuse, we were able to put together a Conference that we hope will inspire and start those new editors on the track towards a successful year for their law review. I look forward to seeing you at the NCLR in March. The best way to help new editors get on track fast is to make a law review training plan. In this blog post we share steps you can take to start preparing a plan for your law review board transition.